Until recently, parenteral nutrition was the standard of care for all patients with intestinal failure. The success of kidney, liver, and heart transplantation has increased with the advent and application of new antirejection medications coupled with improved surgical techniques. Advances in intestinal transplantation, by contrast, have been slow to develop until recently. At the turn of the 20th century, Alexis Carrel demonstrated the technical feasibility of intestinal transplantation; however, acute allograft rejection was an insurmountable obstacle in the absence of immunosuppressive medications. In the 1960s, surgeons demonstrated renewed interest in intestinal transplantation following early successes with kidney transplantation. This interest rapidly waned as the inadequacy of the immunosuppressive medications available at the time became apparent. Total parenteral nutrition (TPN) became available in 1969, with a number of patients relying on it for complete support. At first, all patients on TPN required continuous hospitalization. Today, TPN is safely used in outpatient management. Pooled data from the North American Home Parental and Enteral Patient Registry show 1- and 4-year survival rates for patients with short bowel syndrome (SBS) who received TPN at home to be 94% and 80%, respectively. Only 5-11% of deaths were directly attributed to TPN, with the vast majority of deaths related to progression of the underlying primary disease. The success of TPN supplanted the then urgent need to find solutions for the problems with intestinal transplantation, and TPN became the standard of care. Recently, however, intestinal transplantation has been offered to that minority of the patients on long-term TPN who have severe and life-threatening complications related to this therapy. [2, 3] This restricted indication is, however, likely to be broadened as a consequence of the improved patient and graft survival and cost-effectiveness data that have been seen in the last few years. After 6 weeks of TPN, up to 100% of patients have biliary disease. Biliary sludge is almost universal; gallstones may develop. Intestinal transplantation achieved a clear recognition in the management of complicated total parenteral nutrition (TPN) with Medicare approval (see below). The relatively brief history of this procedure before this included dismal outcomes prior to 1990 and a moratorium during 1994 as a consequence of the high morbidity and mortality associated with the procedure. However, in 1995, rapid improvements in outcomes were seen as results of technical and immunosuppression development. By and large, this success is a consequence of multiple endeavors. These include progress in immunosuppressive therapy, refinement to surgical techniques,  improvement in post-transplant care, better understanding of intestinal immunology, and protocols implemented for anti-infectious monitoring and prophylaxis (primarily against cytomegalovirus [CMV] infection). These actions have translated to improvements in patient and graft survival over the last few years. With this, intestinal transplantation will soon be cost effective; this author believes that intestinal transplantation is not far away from supplanting TPN in the management of short bowel syndrome that requires long-term TPN. Data from Sudan support the cost-effectiveness following 2 years after transplantation. On October 4, 2000, the US Health Care Financing Administration (HCFA) approved coverage by Medicare for intestinal transplantation. Medicare agreed to cover all types of intestinal transplants for patients with irreversible intestinal failure who have specific life-threatening complications (noted with ** above) from long-term intravenous nutrition and TPN. Medicare's criteria for approved centers include an annual volume of at least 10 intestinal transplants and a 1-year actuarial survival of at least 65%. The decision was important because most state Medicaid and other third-party payers in the United States followed suit and provided reimbursement for intestinal transplantation. Significant shifts in intestinal transplant programs have been noted along with a significant reduction in the number of transplants in the United States over the last 5 years. Concurrent with this reduction, transplant programs have placed a greater focus on refining and optimizing the management of patients with rehabilitation and are using multidisciplinary approaches to intestinal failure and short bowel syndrome. Evidence supports that this measure has reduced the likelihood of developing an indication for intestinal transplantation; when coupled with refinements in the management of TPN-dependent intestinal failure (with novel agents like teduglutide), the authors feel reductions in overall listings will continue over time. In 2013, the UNOS Liver and Intestinal Transplantation Committee of the United States revised the organ allocation policy. They sought to reduce what was a high wait list mortality for combined liver and intestinal transplantation (LSBT). The committee gave a priority in the allocation system above the current model for end stage liver disease (MELD) allocation for recipients awaiting LSBT. Interestingly, the percentage of patients removed for death on the wait list over the last 4 years has reduced; this occurred prior to implementation of the new allocation policy. Over the last 5 years, the total number of transplants and total number of listings for intestinal transplantation has declined. Patients with SBS have insufficient small bowel length to support energy (caloric) needs; this typically occurs when at least 80% of the small intestine has been resected. Resection of less than 80% of the length of the bowel is generally accompanied by intestinal adaptation and subsequent enteral tolerance. Considerable interindividual variability occurs among patients. Some individuals may require TPN despite having less than 80% of their small intestine resected, while others may not require TPN after more extensive resections. This fact emphasizes the importance of trials of enteral tolerance and nutritional rehabilitation while assessing an individual with SBS (see Intestinal rehabilitation). Additional factors that may help predict those likely to achieve enteral tolerance include younger age, the presence of an ileocecal valve, and the presence of an ileum. The functional causes of intestinal failure in those with normal bowel length include intestinal aganglionosis, chronic idiopathic intestinal pseudoobstruction, and congenital mucosal abnormalities such as microvillous inclusion disease. The most common cause of death for individuals permanently dependent on TPN is liver failure. Steatohepatitis and cholelithiasis with or without associated cholecystitis are common in patients on TPN and warrant exclusion before the physician makes a diagnosis of TPN-induced liver disease. Advanced TPN-induced liver disease is irreversible; however, when it is identified early it is often reversible with discontinuation of TPN. Progressive liver disease is more common in young children on TPN and is often associated with a history of multiple resections and recurrent infection. Progressive and irreversible liver disease develops in 2-42% of children and adults with intestinal failure due to SBS. [10, 11, 12, 13, 14] The development of liver disease may be related to enteric stasis, the ability to establish some degree of enteral tolerance, catheter-related sepsis, age, a history of prematurity, the extent of bowel resection, the presence of an underlying inflammatory condition, or the length of time on TPN. [15, 16, 17, 18, 12, 14] The mediators and pathways responsible for the progression of TPN-associated liver disease to end-stage liver disease remain undefined. To illustrate the problems faced in the setting of intestinal transplantation, an illustration of the variables and the impact of these variables upon the patient's outcome must be remembered. Patients who are admitted from home for their transplant procedure have better survival rates than those who are inpatients at the time they are taken to the transplant procedure. Central vascular access is required for the procedure and in settings in which access is reduced and technical complications and management of posttransplantation complications is increased. Loss of access complicates the procedure by limiting alternative sites for central access should a catheter need to be removed or repositioned. This central access is important for the provision of perioperative PN and is essential for resuscitation, perioperative fluids, and medication maintenance required in the peritransplant period. At some centers, clinicians have decided that the transplantation cannot be performed if all upper and lower central access is lost, which illustrates the necessity for referral if vascular access loss develops. Access loss of 2 major access sites is generally an indication for intestinal transplantation. Patients with a significant loss to central vascular access may lose eligibility for transplantation. This illustrates the necessity for referral if vascular access loss begins to develop. Advanced liver disease may not preclude isolated intestinal transplantation; however, in the presence of advanced liver disease, isolated intestinal transplantation is generally not possible. Waiting list mortality is higher in those awaiting LSBT than in those awaiting isolated liver transplantation or isolated bowel transplantation. Evaluate and document TPN complications experienced by the patient. Establish the length and function of the remnant native intestine. Assess the function of the remnant intestine and potential for establishing enteral tolerance. Determine the degree of liver dysfunction and the potential for reversibility. Identify any comorbid conditions that may impact upon the outcome of intestinal transplantation, and identify potential problems (eg, thrombosis of major vessels). One critical aspect of the evaluation process is to determine whether the patient's intestinal failure is potentially reversible. Most information regarding nutritional assessment comes from a carefully obtained patient history. Particular attention is given to TPN regimens, prior attempts to achieve enteral tolerance, current enteral feeding protocols, growth, development, and exclusion of nutritional deficiencies. Multidisciplinary consultation with experienced pediatric nutritionists, gastroenterologists, and hepatologists is invaluable before determining the presence or absence of nutritional deficiencies and complications from long-term TPN. Many routine screening studies are listed in Workup. In addition to a thorough history and review of operative records, evaluation of the length and function of the remnant native bowel is further accomplished through radiographic contrast studies. These studies help delineate the length of the remaining small bowel, its anatomic location, the presence or absence of the ileocecal valve, the caliber of the remaining small and large intestine, and the transit time from the proximal to distal bowel. These studies also may help define surgically correctable diseases that permit enteral tolerance without transplantation. Occasionally, additional motility studies are necessary. The medical and surgical team must be rigorous when establishing the presence of intestinal failure and when defining its cause because Munchausen syndrome by proxy has been reported in an intestinal transplant recipient. For patients with functional disease, review of histopathologic findings following bowel biopsy is important to confirm the diagnosis and extent of bowel involvement. During the assessment of TPN complications, the physician must decide whether a patient's TPN-related liver disease is reversible. This decision may be difficult, and considerations include liver biopsy findings and the likelihood of progression during the waiting period. The presence of dense, bridging fibrosis may prompt consideration of LSB transplantation. Minor amounts of fibrosis associated with cholestasis may allow ISB transplantation. However, if rapid progression of the disease is observed and a long waiting period is anticipated (eg, small infants), combined listing for LSB transplantation may be indicated. Doppler ultrasonography is used to assess venous access and to determine the patency of the central veins. Intestinal transplantation is considered when the patient has lost 2 or more common venous access sites, such as the subclavian or internal jugular veins, or when unconventional sites such as the right atrial, transhepatic, or direct inferior vena caval catheters are required. Patient history and previous records should reveal the number and type of organisms responsible for previous central venous line infections. Fungal infections requiring mechanical ventilation or vasopressor support are most worrisome. [19, 30] Furthermore, a history of infection with multidrug-resistant organisms should raise concern for future mortality and should be considered in the overall assessment. Comorbid conditions can greatly increase the likelihood of complications in the posttransplant period. Specific evaluations of other organ systems are dictated by patient history and are further directed by any abnormalities identified from the results of baseline studies. For example, intestinal failure as a consequence of necrotizing enterocolitis may be associated with a history of prolonged neonatal ventilation and bronchopulmonary dysplasia. These conditions are associated with repeated hospitalizations and a propensity for prematurity in infants, which may give rise to behavioral and developmental problems that should be identified and addressed as early as possible. However, controlled trials to support this are lacking. The authors strongly believe that early intervention facilitates posttransplant recovery and that such interventions are important. Portions of these evaluations are incorporated into the psychosocial assessment of the patient and the patient's support system. For isolated intestinal transplantation, en bloc removal of the donor intestine commences at the pylorus and proceeds as far as the terminal ileum. 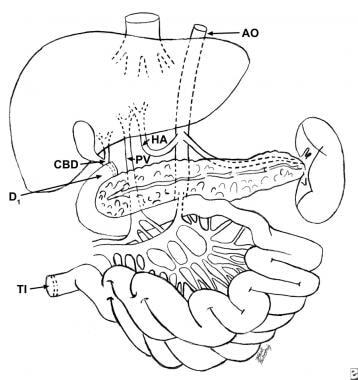 Anatomy of the donor operation, with procurement of the liver, small bowel, pancreas, and spleen en bloc (AO, thoracic aorta; HA, hepatic artery; PV, portal vein; CBD, common bile duct; D1, first part of the duodenum; TI, terminal ileum). Inclusion of the colon in the graft has been associated with worse patient survival, presumably because of increased septic complications as demonstrated by researchers from the University of Pittsburgh. Inclusion of the stomach has been associated with poor gastric motility (personal communications). The superior mesenteric artery and vein provide the blood supply to the organ. When performing a combined LSB transplantation, the duodenum and head of the pancreas are retained in the allograft. In preparation for multivisceral transplantation, other abdominal organs are obtained at the time of intestinal procurement, most commonly the entire donor pancreas. The allograft is prepared in the operating room before implantation. The recipient's requirements dictate which technique should be performed; these requirements are described later. For all recipients, bowel continuity is the ultimate goal, and proximal and distal enteric anastomoses are performed at the time of allograft implantation. Carrel A. The transplantation of organs. A preliminary communication. JAMA. 1905. 45:1654. Fryer JP. The current status of intestinal transplantation. Curr Opin Organ Transplant. 2008 Jun. 13(3):266-72. [Medline]. Sauvat F, Fusaro F, Lacaille F, et al. Is intestinal transplantation the future of children with definitive intestinal insufficiency?. Eur J Pediatr Surg. 2008 Dec. 18(6):368-71. [Medline]. Abu-Elmagd K, Reyes J, Bond G, et al. Clinical intestinal transplantation: a decade of experience at a single center. Ann Surg. 2001 Sep. 234(3):404-16; discussion 416-7. [Medline]. Bharadwaj S, Tandon P, Gohel TD, Brown J, Steiger E, Kirby DF, et al. Current status of intestinal and multivisceral transplantation. Gastroenterol Rep (Oxf). 2017 Feb. 5 (1):20-28. [Medline]. [Full Text]. Selvaggi G, Tzakis AG. Small bowel transplantation: technical advances/updates. Curr Opin Organ Transplant. 2009 Jun. 14(3):262-6. [Medline]. Rees MA, Amesur NB, Cruz RJ, Borhani AA, Abu-Elmagd KM, Costa G, et al. Imaging of Intestinal and Multivisceral Transplantation. Radiographics. 2018 Mar-Apr. 38 (2):413-432. [Medline]. Stanger JD, Oliveira C, Blackmore C, Avitzur Y, Wales PW. The impact of multi-disciplinary intestinal rehabilitation programs on the outcome of pediatric patients with intestinal failure: a systematic review and meta-analysis. J Pediatr Surg. 2013 May. 48(5):983-92. [Medline]. Smith JM, Skeans MA, Horslen SP, Edwards EB, Harper AM, Snyderf JJ, et al. OPTN/SRTR 2012 Annual Data Report: intestine. Am J Transplant. 2014 Jan. 14 Suppl 1:97-111. [Medline]. Colomb V, Goulet O, De Potter S, Ricour C. Liver disease associated with long-term parenteral nutrition in children. Transplant Proc. 1994 Jun. 26(3):1467. [Medline]. Sondheimer JM, Asturias E, Cadnapaphornchai M. Infection and cholestasis in neonates with intestinal resection and long-term parenteral nutrition. J Pediatr Gastroenterol Nutr. 1998 Aug. 27(2):131-7. [Medline]. Chan S, McCowen KC, Bistrian BR, et al. Incidence, prognosis, and etiology of end-stage liver disease in patients receiving home total parenteral nutrition. Surgery. 1999 Jul. 126(1):28-34. [Medline]. Wasa M, Takagi Y, Sando K, et al. Long-term outcome of short bowel syndrome in adult and pediatric patients. JPEN J Parenter Enteral Nutr. 1999 Sep-Oct. 23(5 Suppl):S110-2. [Medline]. Cavicchi M, Beau P, Crenn P, et al. Prevalence of liver disease and contributing factors in patients receiving home parenteral nutrition for permanent intestinal failure. Ann Intern Med. 2000 Apr 4. 132(7):525-32. [Medline]. Bowyer BA, Fleming CR, Ludwig J, et al. Does long-term home parenteral nutrition in adult patients cause chronic liver disease?. JPEN J Parenter Enteral Nutr. 1985 Jan-Feb. 9(1):11-7. [Medline]. Stokes MA, Irving MH. Mortality in patients on home parenteral nutrition. JPEN J Parenter Enteral Nutr. 1989 Mar-Apr. 13(2):172-5. [Medline]. Wolf A, Pohlandt F. Bacterial infection: the main cause of acute cholestasis in newborn infants receiving short-term parenteral nutrition. J Pediatr Gastroenterol Nutr. 1989 Apr. 8(3):297-303. [Medline]. Williams N, Scott NA, Irving MH. Catheter-related morbidity in patients on home parenteral nutrition: implications for small bowel transplantation. Ann R Coll Surg Engl. 1994 Nov. 76(6):384-6. [Medline]. Burnes JU, O'Keefe SJ, Fleming CR, et al. Home parenteral nutrition--a 3-year analysis of clinical and laboratory monitoring. JPEN J Parenter Enteral Nutr. 1992 Jul-Aug. 16(4):327-32. [Medline]. Broviac JW, Cole JJ, Scribner BH. A silicone rubber atrial catheter for prolonged parenteral alimentation. Surg Gynecol Obstet. 1973 Apr. 136(4):602-6. [Medline]. Flowers RH 3rd, Schwenzer KJ, Kopel RF, et al. Efficacy of an attachable subcutaneous cuff for the prevention of intravascular catheter-related infection. A randomized, controlled trial. JAMA. 1989 Feb 10. 261(6):878-83. [Medline]. Mermel LA. Prevention of intravascular catheter-related infections. Ann Intern Med. 2000 Mar 7. 132(5):391-402. [Medline]. Grant D. Intestinal transplantation: 1997 report of the international registry. Intestinal Transplant Registry. Transplantation. 1999 Apr 15. 67(7):1061-4. [Medline]. Howard L, Hassan N. Home parenteral nutrition. 25 years later. Gastroenterol Clin North Am. 1998 Jun. 27(2):481-512. [Medline]. Pironi L, Joly F, Forbes A, et al. Long-term follow-up of patients on home parenteral nutrition in Europe: implications for intestinal transplantation. Gut. 2011 Jan. 60(1):17-25. [Medline]. Desai CS, Khan KM, Gruessner AC, Fishbein TM, Gruessner RW. Intestinal retransplantation: analysis of Organ Procurement and Transplantation Network database. Transplantation. 2012 Jan 15. 93(1):120-5. [Medline]. Lacaille F, Vass N, Sauvat F, et al. Long-term outcome, growth and digestive function in children 2 to 18 years after intestinal transplantation. Gut. 2008 Apr. 57(4):455-61. [Medline]. Kosmach B, Tarbell S, Reyes J, Todo S. "Munchausen by proxy" syndrome in a small bowel transplant recipient. Transplant Proc. 1996 Oct. 28(5):2790-1. [Medline]. Sudan DL, Kaufman SS, Shaw BW Jr, et al. Isolated intestinal transplantation for intestinal failure. Am J Gastroenterol. 2000 Jun. 95(6):1506-15. [Medline]. Howard L, Heaphey L, Fleming CR, et al. Four years of North American registry home parenteral nutrition outcome data and their implications for patient management. JPEN J Parenter Enteral Nutr. 1991 Jul-Aug. 15(4):384-93. [Medline]. DeRoover A, Langnas A. Surgical methods of small bowel transplantation. Curr Opin Organ Transplant. 1999. 4(4):335-42. Asfar S, Atkison P, Ghent C, et al. Small bowel transplantation. A life-saving option for selected patients with intestinal failure. Dig Dis Sci. 1996 May. 41(5):875-83. [Medline]. Quigley EM. Small intestinal transplantation: reflections on an evolving approach to intestinal failure. Gastroenterology. 1996 Jun. 110(6):2009-12. [Medline]. Fishbein TM, Florman S, Gondolesi G, et al. Intestinal transplantation before and after the introduction of sirolimus. Transplantation. 2002. 73(10):1538-42. [Medline]. O'Keefe S, et al. Teduglutide, a Novel GLP-2 Analog, in the Management of Short Bowel Syndrome (SBS) Patients Dependent On Parenteral Nutrition: a Multicenter, Multinational Placebo-Controlled Clinical Trial. Clinical Science Plenary Session, Digestive Diseases Week, 2008. Available at http://www.drugs.com/clinical_trials/phase-3-gattex-results-presented-annual-digestive-week-congress-highlight-potential-new-short-bowel-4346.html. Accessed: June 12, 2009. Jeppesen PB, et al. Abstract #906. Teduglutide, a Novel Analogue of Glucagon-like Peptide 2#906 (GLP-2), Is Effective and Safe in Reducing Parenteral Support Volume in Short Bowel Syndrome–Intestinal Failure Subjects: Results From a 24-Week, Placebo-Controlled Phase 3 Trial). DDW. 2011. Kato T, Selvaggi G, Gaynor JJ, et al. Inclusion of donor colon and ileocecal valve in intestinal transplantation. Transplantation. 2008 Jul 27. 86(2):293-7. [Medline]. Matsumoto CS, Kaufman SS, Fishbein TM. Inclusion of the colon in intestinal transplantation. Curr Opin Organ Transplant. 2011 Jun. 16(3):312-5. [Medline]. O'Keefe SJ, Emerling M, Koritsky D, Martin D, Stamos J, Kandil H, et al. Nutrition and quality of life following small intestinal transplantation. Am J Gastroenterol. May/2007. 102(5):1093-100. [Medline]. Todo S, Reyes J, Furukawa H, et al. Outcome analysis of 71 clinical intestinal transplantations. Ann Surg. 1995 Sep. 222(3):270-80; discussion 280-2. [Medline]. Furukawa H, Kusne S, Abu-Elmagd K, et al. Effect of CMV serology on outcome after clinical intestinal transplantation. Transplant Proc. 1996 Oct. 28(5):2780-1. [Medline]. Reynolds DW, Stagno S, Reynolds R, Alford CA Jr. Perinatal cytomegalovirus infection: influence of placentally transferred maternal antibody. J Infect Dis. 1978 May. 137(5):564-7. [Medline]. Cohen Z, Silverman RE, Wassef R, et al. Small intestinal transplantation using cyclosporine. Report of a case. Transplantation. 1986 Dec. 42(6):613-21. [Medline]. Masetti M, Rodriguez MM, Thompson JF, et al. Multivisceral transplantation for megacystis microcolon intestinal hypoperistalsis syndrome. Transplantation. 1999 Jul 27. 68(2):228-32. [Medline]. de Ville de Goyet J, Mitchell A, Mayer AD, et al. En block combined reduced-liver and small bowel transplants: from large donors to small children. Transplantation. 2000 Feb 27. 69(4):555-9. [Medline]. Karatzas T, Khan F, Tzakis AG. Clinical intestinal transplantation: experience in Miami. Transplant Proc. 1997 May. 29(3):1787-9. [Medline]. Reyes J, Bueno J, Kocoshis S, et al. Current status of intestinal transplantation in children. J Pediatr Surg. 1998 Feb. 33(2):243-54. [Medline]. Herlenius G, Fagerlind M, Krantz M, et al. Chronic kidney disease--a common and serious complication after intestinal transplantation. Transplantation. 2008 Jul 15. 86(1):108-13. [Medline]. Abu-Elmagd K, Reyes J, Todo S, et al. Clinical intestinal transplantation: new perspectives and immunologic considerations. J Am Coll Surg. 1998 May. 186(5):512-25; discussion 525-7. [Medline]. Sudan DL, Kaufman S, Horslen S, et al. Incidence, timing, and histologic grade of acute rejection in small bowel transplant recipients. Transplant Proc. 2000 Sep. 32(6):1199. [Medline]. Rana A, Robles S, Russo MJ, et al. The combined organ effect: protection against rejection?. Ann Surg. 2008 Nov. 248(5):871-9. [Medline]. Andres AM, Lopez Santamaría M, Ramos E, Hernandez F, Prieto G, Encinas J, et al. The use of sirolimus as a rescue therapy in pediatric intestinal transplant recipients. Pediatr Transplant. 2010 Nov. 14(7):931-5. [Medline]. Kusne S, Furukawa H, Abu-Elmagd K, et al. Infectious complications after small bowel transplantation in adults: an update. Transplant Proc. 1996 Oct. 28(5):2761-2. [Medline]. Green M, Reyes J, Nour B, et al. Early infectious complications of liver-intestinal transplantation in children: preliminary analysis. Transplant Proc. 1994 Jun. 26(3):1420-1. [Medline]. Manez R, Kusne S, Green M, et al. Incidence and risk factors associated with the development of cytomegalovirus disease after intestinal transplantation. Transplantation. 1995 Apr 15. 59(7):1010-4. [Medline]. Nalesnik MA, Jaffe R, Starzl TE, et al. The pathology of posttransplant lymphoproliferative disorders occurring in the setting of cyclosporine A-prednisone immunosuppression. Am J Pathol. 1988 Oct. 133(1):173-92. [Medline]. Nalesnik M, Reyes J, Mazieriegos G, et al. Posttransplant lymphoproliferative disorders (PTLD) in small bowel allograft recipients. Presented at: Sixth International Small Bowel Transplant Symposium. University of Pittsburgh Medical Center; Pittsburgh, Pa:. 1999. Elstrom RL, Andreadis C, Aqui NA, et al. Treatment of PTLD with rituximab or chemotherapy. Am J Transplant. 2006 Mar. 6(3):569-76. [Medline]. Lee JJ, Lam MS, Rosenberg A. Role of chemotherapy and rituximab for treatment of posttransplant lymphoproliferative disorder in solid organ transplantation. Ann Pharmacother. 2007 Oct. 41(10):1648-59. [Medline]. Vianna RM, Mangus RS, Fridell JA, Weigman S, Kazimi M, Tector J. Induction immunosuppression with thymoglobulin and rituximab in intestinal and multivisceral transplantation. Transplantation. 2008 May 15. 85(9):1290-3. [Medline]. Pirenne J, Gruessner AC, Benedetti E, et al. Donor-specific unmodified bone marrow transfusion does not facilitate intestinal engraftment after bowel transplantation in a porcine model. Surgery. 1997 Jan. 121(1):79-88. [Medline]. Sharkey LM, Peacock S, Russell NK, Middleton SJ, Butler AJ. Graft versus host disease after multivisceral transplantation: A UK center experience and update on management. Clin Transplant. 2018 Mar 15. e13239. [Medline]. Matsumoto S, Tanaka S, Orita K. Effect of donor pretreatment on graft-versus-host disease (GVHD) after rat small-bowel transplantation (SBTX). Transplant Proc. 1994 Aug. 26(4):2306-8. [Medline]. Bacigalupo A, van Lint MT, Frassoni F, et al. High dose bolus methylprednisolone for the treatment of acute graft versus host disease. Blood. 1983 Mar. 46(3):125-32. [Medline]. Ojo AO, Held PJ, Port FK, et al. Chronic renal failure after transplantation of a nonrenal organ. N Engl J Med. 2003. 349(10):931-40. [Medline]. Rovera GM, DiMartini A, Schoen RE, et al. Quality of life of patients after intestinal transplantation. Transplantation. 1998 Nov 15. 66(9):1141-5. [Medline]. Ngo KD, Farmer DG, McDiarmid SV, Artavia K, Ament ME, Vargas J, et al. Pediatric health-related quality of life after intestinal transplantation. Pediatr Transplant. 2011 Dec. 15(8):849-54. [Medline]. Grant D, Abu-Elmagd K, Reyes J, et al. 2003 report of the intestine transplant registry: a new era has dawned. Ann Surg. 2005 Apr. 241(4):607-13. Fishbein TM, Schiano T, LeLeiko N, et al. An integrated approach to intestinal failure: results of a new program with total parenteral nutrition, bowel rehabilitation, and transplantation. J Gastrointest Surg. 2002 Jul-Aug. 6(4):554-62. Matarese LE, Seidner DL, Steiger E, Fazio V. Practical guide to intestinal rehabilitation for postresection intestinal failure: a case study. Nutr Clin Pract. 2005. 20(5):551-8. [Medline]. Higham SE, Read NW. Effect of ingestion of fat on ileostomy effluent. Gut. 1990. 31(4):435-8. [Medline]. Haderslev KV, Tjellesen L, Sorensen HA, Staun M. Effect of cyclical intravenous clodronate therapy on bone mineral density and markers of bone turnover in patients receiving home parenteral nutrition. Am J Clin Nutr. 2002. 76(2):482-8. [Medline]. Byrne TA, Wilmore DW, Iyer K. Growth hormone, glutamine, and an optimal diet reduces parenteral nutrition in patients with short bowel syndrome: a prospective, randomized, placebo-controlled, double-blind clinical trial. Ann Surg. 2005. 242(5):655-61. [Medline]. Jeppesen PB, Sanguinetti EL, Buchman A, et al. Teduglutide (ALX-0600), a dipeptidyl peptidase IV resistant glucagon-like peptide 2 analogue, improves intestinal function in short bowel syndrome patients. Gut. 2005 Sep. 54(9):1224-31. Bianchi A. Autologous gastrointestinal reconstruction. Semin Pediatr Surg. 1995 Feb. 4(1):54-9. Kim HB, Lee PW, Garza J, et al. Serial transverse enteroplasty for short bowel syndrome: a case report. J Pediatr Surg. 2003 Jun. 38(6):881-5. Howard L, Ament M, Fleming CR, et al. Current use and clinical outcome of home parenteral and enteral nutrition therapies in the United States. Gastroenterology. 1995 Aug. 109(2):355-65. [Medline]. Reyes J, Fishbein T, Bueno J, et al. Reduced-size orthotopic composite liver-intestinal allograft. Transplantation. 1998 Aug 27. 66(4):489-92. [Medline]. Sigalet DL, Williams DC, Garola R, et al. Impact of FK506 and steroids on adaptation after intestinal resection or segmental transplantation. Pediatr Transplant. 2000 Feb. 4(1):12-20. [Medline]. Muiesan P, Dhawan A, Novelli M, et al. Isolated liver transplant and sequential small bowel transplantation for intestinal failure and related liver disease in children. Transplantation. 2000 Jun 15. 69(11):2323-6. [Medline]. Abu-Elmagd KM, Reyes J, Fung JJ, et al. Evolution of clinical intestinal transplantation: improved outcome and cost effectiveness. Transplant Proc. 1999 Feb-Mar. 31(1-2):582-4. [Medline]. Gupte GL, Beath SV, Protheroe S, et al. Improved outcome of referrals for intestinal transplantation in the UK. Arch Dis Child. 2007. 92(2):147-52. [Medline]. Schalamon J, Mayr JM, Hollwarth ME. Mortality and economics in short bowel syndrome. Best Pract Res Clin Gastroenterol. 2003. 17(6):931-42. [Medline]. Abu-Elmagd KM, Mazariegos G. Intestinal transplantation and the European implication: impact of experience and study design. Gut. 2012 Jan. 61(1):166; author reply 167. [Medline]. Patil PB, Chougule PB, Kumar VK, Almström S, Bäckdahl H, Banerjee D. Recellularization of acellular human small intestine using bone marrow stem cells. Stem Cells Transl Med. 2013 Apr. 2(4):307-15. [Medline]. Spurrier RG, Grikscheit TC. Tissue engineering the small intestine. Clin Gastroenterol Hepatol. 2013 Apr. 11(4):354-8. [Medline]. Grikscheit TC, Siddique A, Ochoa ER, Srinivasan A, Alsberg E, Hodin RA. Tissue-engineered small intestine improves recovery after massive small bowel resection. Ann Surg. 2004 Nov. 240(5):748-54. [Medline]. Abu-Elmagd KM. Intestinal transplantation for short bowel syndrome and gastrointestinal failure: current consensus, rewarding outcomes, and practical guidelines. Gastroenterology. 2006 Feb. 130(2 Suppl 1):S132-7. Ahmed R, Segal I, Hassan H. Fermentation of dietary starch in humans. Am J Gastroenterol. 2000. 95(4):1017-20. [Medline]. Alican F, Hardy JD, Cayirli M, et al. Intestinal transplantation: laboratory experience and report of a clinical case. Am J Surg. 1971 Feb. 121(2):150-9. [Medline]. Alqahtani SA. Update in liver transplantation. Discov Med. 2012 Aug. 14(75):133-41. [Medline]. Bittermann T, Makar G, Goldberg D. Exception point applications for 15 points: an unintended consequence of the share 15 policy. Liver Transpl. 2012 Nov. 18(11):1302-9. [Medline]. Broviac JW, Scribner BH. Prolonged parenteral nutrition in the home. Surg Gynecol Obstet. 1974 Jul. 139(1):24-8. [Medline]. Buchman AL. Etiology and initial management of short bowel syndrome. Gastroenterology. 2006 Feb. 130(2 Suppl 1):S5-S15. Buchman AL, Iyer K, Fryer J. Parenteral nutrition-associated liver disease and the role for isolated intestine and intestine/liver transplantation. Hepatology. 2006 Jan. 43(1):9-19. Buchman AL, Scolapio J, Fryer J. AGA technical review on short bowel syndrome and intestinal transplantation. Gastroenterology. 2003 Apr. 124(4):1111-34. Cai J. Intestine and multivisceral transplantation in the United States: a report of 20-year national registry data (1990-2009). Clin Transpl. 2009. 83-101. [Medline]. Carson KL, Hunt CM. Medical problems occurring after orthotopic liver transplantation. Dig Dis Sci. 1997 Aug. 42(8):1666-74. [Medline]. Colomb V, De Potter S, Goulet O, et al. Potential candidates for small bowel transplantation in pediatric patients on home parenteral nutrition. Transplant Proc. 1996 Oct. 28(5):2698. [Medline]. Connor FL, Di Lorenzo C. Chronic intestinal pseudo-obstruction: assessment and management. Gastroenterology. 2006 Feb. 130(2 Suppl 1):S29-36. Fishbein T, Schiano T, Jaffe D, et al. Isolated intestinal transplantation in adults with non-reconstructible GI tract. Presented at: Sixth International Small Bowel Transplant Symposium. New York, NY: The Recanati/Miller Transplantation Institute; Mount Sinai Hospital; 1999. Fujishiro J, Pech TC, Finger TF, Praktinjo M, Stoffels B, Standop J. Influence of immunosuppression on alloresponse, inflammation and contractile function of graft after intestinal transplantation. Am J Transplant. 2010 Jul. 10(7):1545-55. [Medline]. Gambarara M, Goulet O, Bagolan P, et al. Long-term parenteral nutrition in the management of extremely short bowel syndrome. Transplant Proc. 1998 Sep. 30(6):2539-40. [Medline]. Garcia M, Weppler D, Mittal N, et al. Campath-1H immunosuppressive therapy reduces incidence and intensity of acute rejection in intestinal and multivisceral transplantation. Transplant Proc. 2004 Mar. 36(2):323-4. [Medline]. Gondolesi G, Fishbein T, Chehade M, et al. Serum citrulline is a potential marker for rejection of intestinal allografts. Transplant Proc. 2002 May. 34(3):918-20. Gotthardt DN, Gauss A, Zech U, Mehrabi A, Weiss KH, Sauer P. Indications for intestinal transplantation: recognizing the scope and limits of total parenteral nutrition. Clin Transplant. 2013 Jul-Aug. 27 Suppl 25:49-55. [Medline]. Goulet OJ, Revillon Y, Cerf-Bensussan N, et al. Small intestinal transplantation in a child using cyclosporine. Transplant Proc. 1988 Jun. 20(3 Suppl 3):288-96. [Medline]. Gracz AD, Magness ST. Sry-box (Sox) transcription factors in gastrointestinal physiology and disease. Am J Physiol Gastrointest Liver Physiol. 2011 Apr. 300(4):G503-15. [Medline]. Grant D, Lamont D, Zhong R, et al. 51Cr-EDTA: a marker of early intestinal rejection in the rat. J Surg Res. 1989 May. 46(5):507-14. [Medline]. Grant D, Wall W, Mimeault R, et al. Successful small-bowel/liver transplantation. Lancet. 1990 Jan 27. 335(8683):181-4. [Medline]. Gross TG, Hinrichs SH, Winner J, et al. Treatment of post-transplant lymphoproliferative disease (PTLD) following solid organ transplantation with low-dose chemotherapy. Ann Oncol. 1998 Mar. 9(3):339-40. [Medline]. Hanto DW, Fishbein TM, Pinson CW, et al. Liver and intestine transplantation: summary analysis, 1994-2003. Am J Transplant. 2005 Apr. 5(4 Pt 2):916-33. Horslen SP, Kaufman SS, Sudan DL, et al. Isolated liver transplantation in infants with total parenteral nutrition-associated end-stage liver disease. Transplant Proc. 2000 Sep. 32(6):1241. [Medline]. Howard L, Malone M. Current status of home parenteral nutrition in the United States. Transplant Proc. 1996 Oct. 28(5):2691-5. [Medline]. Iyer K, Kaufman S, Sudan D, et al. Long-term results of intestinal transplantation for pseudo-obstruction in children. J Pediatr Surg. 2001 Jan. 36(1):174-7. [Medline]. Iyer KR, Horslen S, Torres C, et al. Functional liver recovery parallels autologous gut salvage in short bowel syndrome. J Pediatr Surg. 2004 Mar. 39(3):340-4; discussion 340-4. Jeppesen PB. Glucagon-like peptide-2: update of the recent clinical trials. Gastroenterology. 2006 Feb. 130(2 Suppl 1):S127-31. Jeppesen PB, Gilroy R, Pertkiewicz M, Allard JP, Messing B, O'Keefe SJ. Randomised placebo-controlled trial of teduglutide in reducing parenteral nutrition and/or intravenous fluid requirements in patients with short bowel syndrome. Gut. 2011 Feb 11. [Epub ahead of print]. [Medline]. Jeppesen PB, Hartmann B, Thulesen J, et al. Glucagon-like peptide 2 improves nutrient absorption and nutritional status in short-bowel patients with no colon. Gastroenterology. 2001 Mar. 120(4):806-15. Kaplan J, Han L, Halgrimson W, Wang E, Fryer J. The impact of MELD/PELD revisions on the mortality of liver-intestine transplantation candidates. Am J Transplant. 2011 Sep. 11(9):1896-904. [Medline]. Kato T, O'Brien CB, Nishida S, et al. The first case report of the use of a zoom videoendoscope for the evaluation of small bowel graft mucosa in a human after intestinal transplantation. Gastrointest Endosc. 1999 Aug. 50(2):257-61. [Medline]. Kimura T, Lauro A, Cescon M, et al. Impact of induction therapy on bacterial infections and long-term outcome in adult intestinal and multivisceral transplantation: a comparison of two different induction protocols: daclizumab vs. alemtuzumab. Clin Transplant. 2009 Jun-Jul. 23(3):420-5. [Medline]. Lawrence JP, Dunn SP, Billmire DF, et al. Isolated liver transplantation for liver failure in patients with short bowel syndrome. J Pediatr Surg. 1994 Jun. 29(6):751-3. [Medline]. Lee RG, Nakamura K, Tsamandas AC, et al. Pathology of human intestinal transplantation. Gastroenterology. 1996 Jun. 110(6):1820-34. [Medline]. Lillehei RC, Idezuki Y, Feemster JA, et al. Transplantation of stomach, intestine, and pancreas: experimental and clinical observations. Surgery. 1967 Oct. 62(4):721-41. [Medline]. Mangus RS, Tector AJ, Kubal CA, Fridell JA, Vianna RM. Multivisceral transplantation: expanding indications and improving outcomes. J Gastrointest Surg. 2013 Jan. 17(1):179-86; discussion p.186-7. [Medline]. Matarese LE, O'Keefe SJ, Kandil HM, Bond G, Costa G, Abu-Elmagd K. Short bowel syndrome: clinical guidelines for nutrition management. Nutr Clin Pract. 2005. 20(5):493-502. [Medline]. Mazariegos GV, Soltys K, Bond G, et al. Pediatric intestinal retransplantation: techniques, management, and outcomes. Transplantation. 2008 Dec 27. 86(12):1777-82. [Medline]. Messing B, Lemann M, Landais P, et al. Prognosis of patients with nonmalignant chronic intestinal failure receiving long-term home parenteral nutrition. Gastroenterology. 1995 Apr. 108(4):1005-10. [Medline]. Murase N, Ye Q, Lee RG, et al. Immunomodulation of intestinal transplant with allograft irradiation and simultaneous donor bone marrow infusion. Transplant Proc. 1999 Feb-Mar. 31(1-2):565-6. Nousia-Arvanitakis S, Angelopoulou-Sakadami N, Metroliou K. Complications associated with total parenteral nutrition in infants with short bowel syndrome. Hepatogastroenterology. 1992 Apr. 39(2):169-72. [Medline]. NPS Pharmaceuticals, Inc. New Findings Demonstrate Potential Benefits of GATTEX (teduglutide) in Phase 3 Study of Patients with Short Bowel Syndrome. Press Release. Available at http://finance.yahoo.com/news/New-Findings-Demonstrate-bw-15423422.html?. Accessed: June 15, 2009. O'Keefe SJ, Buchman AL, Fishbein TM, et al. Short bowel syndrome and intestinal failure: consensus definitions and overview. Clin Gastroenterol Hepatol. 2006 Jan. 4(1):6-10. Octavio Ruiz J, Lillehei RC. Intestinal transplantation. Surg Clin North Am. 1972 Aug. 52(4):1075-91. [Medline]. Olivier G, Rettori R, Olivier C. Homotransplantation orthotopique de l'intestin grele et des colons droit et transverse chez l'homme. J Chir. 1969. 98:331-40. Reyes J, Green M, Bueno J, et al. Epstein Barr virus associated posttransplant lymphoproliferative disease after intestinal transplantation. Transplant Proc. 1996 Oct. 28(5):2768-9. [Medline]. Reyes JD. Intestinal transplantation: an unexpected journey. J Pediatr Surg. 2014 Jan. 49(1):13-8. [Medline]. Saginur M, Thiesen A, Lacson A, Bigam D, Yap J. Small intestinal transplant mucosal necrosis associated with enteral sodium polystyrene sulfonate administration. Am J Transplant. 2012 Nov. 12(11):3152-4. [Medline]. Scolapio JS. Short bowel syndrome: recent clinical outcomes with growth hormone. Gastroenterology. 2006 Feb. 130(2 Suppl 1):S122-6. Scott NA, Irving MH. Intestinal failure--the clinical problem. Dig Dis. 1992. 10(5):249-57. [Medline]. Seguy D, Vahedi K, Kapel N, et al. Low-dose growth hormone in adult home parenteral nutrition-dependent short bowel syndrome patients: a positive study. Gastroenterology. 2003 Feb. 124(2):293-302. Shaffer D, Maki T, DeMichele SJ, et al. Studies in small bowel transplantation. Prevention of graft-versus-host disease with preservation of allograft function by donor pretreatment with antilymphocyte serum. Transplantation. 1988 Feb. 45(2):262-9. [Medline]. Shike M, Harrison JE, Sturtridge WC, et al. Metabolic bone disease in patients receiving long-term total parenteral nutrition. Ann Intern Med. 1980 Mar. 92(3):343-50. [Medline]. Shils ME, Wright WL, Turnbull A, Brescia F. Long-term parenteral nutrition through an external arteriovenous shunt. N Engl J Med. 1970 Aug 13. 283(7):341-4. [Medline]. Sigalet DL, Kneteman NM, Fedorak RN, et al. Intestinal function following allogeneic small intestinal transplantation in the rat. Transplantation. 1992 Feb. 53(2):264-71. [Medline]. Sigurdsson L, Reyes J, Kocoshis SA, et al. Intestinal transplantation in children with chronic intestinal pseudo- obstruction. Gut. 1999 Oct. 45(4):570-4. [Medline]. Sindhi R, Fox IJ, Heffron T, et al. Procurement and preparation of human isolated small intestinal grafts for transplantation. Transplantation. 1995 Oct 27. 60(8):771-3. [Medline]. Sindhi R, Landmark J, Shaw BW Jr, et al. Combined liver/small bowel transplantation using a blood group compatible but nonidentical donor. Transplantation. 1996 Jun 27. 61(12):1782-3. [Medline]. Small bowel transplant: an evidence-based analysis. Ont Health Technol Assess Ser. 2003. 3(1):1-72. [Medline]. Starzl TE, Rowe MI, Todo S, et al. Transplantation of multiple abdominal viscera. JAMA. 1989 Mar 10. 261(10):1449-57. [Medline]. Sudan D. Cost and quality of life after intestinal transplantation. Gastroenterology. 2006 Feb. 130(2 Suppl 1):S158-62. Sudan D, DiBaise J, Torres C, et al. A multidisciplinary approach to the treatment of intestinal failure. J Gastrointest Surg. 2005 Feb. 9(2):165-76; discussion 176-7. Sudan DL, Iyer KR, DeRoover A, et al. A new technique for combined liver/small intestinal transplantation. Transplantation. 2001 Dec 15. 72(11):1846-8. [Medline]. Thompson JS, DiBaise JK, Iyer KR, et al. Postoperative short bowel syndrome. J Am Coll Surg. 2005 Jul. 201(1):85-9. Timmermann W, Hoppe H, Gasser M, et al. Noninvasive videomicroscopic monitoring of rat small bowel rejection. Transplant Proc. 1998 Sep. 30(6):2660-1. [Medline]. Tzakis AG, Kato T, Nishida S, et al. Preliminary experience with campath 1H (C1H) in intestinal and liver transplantation. Transplantation. 2003 Apr 27. 75(8):1227-31. Vanderhoof JA, Langnas AN. Short-bowel syndrome in children and adults. Gastroenterology. 1997 Nov. 113(5):1767-78. [Medline]. Vikram HR, Smilack JD, Leighton JA, Crowell MD, De Petris G. Emergence of gastrointestinal basidiobolomycosis in the United States, with a review of worldwide cases. Clin Infect Dis. 2012 Jun. 54(12):1685-91. [Medline]. [Full Text]. Williams JW, Sankary HN, Foster PF, et al. Splanchnic transplantation. An approach to the infant dependent on parenteral nutrition who develops irreversible liver disease. JAMA. 1989 Mar 10. 261(10):1458-62. [Medline]. Wilmore DW, Groff DB, Bishop HC, Dudrick SJ. Total parenteral nutrition in infants with catastrophic gastrointestinal anomalies. J Pediatr Surg. 1969 Apr. 4(2):181-9. [Medline]. Wisecarver JL, Cattral MS, Langnas AN, et al. Transfusion-induced graft-versus-host disease after liver transplantation. Documentation using polymerase chain reaction with HLA- DR sequence-specific primers. Transplantation. 1994 Aug 15. 58(3):269-71. [Medline]. Small bowel recipient operation (AOI, interposition graft of aorta; AOII, Carrel patch bearing celiac trunk and superior mesenteric artery; AOIII, aortic end oversewn below superior mesenteric artery take-off; SV, native splenic vein; P, pancreas, with duct and parenchymal edge oversewn; PB, proximal bowel anastomosis; DB, distal ileocolonic anastomosis; LS, diverting loop ileostomy). Back table operation with mesenteric vessels held within the forceps and the donor intestine within preservation solution. Intestinal graft within the abdominal cavity of the recipient at the time of revascularization. Revascularized bowel prior to closure. In the lower right corner the anastomosis between the donor small bowel and recipient remnant colon can be seen. Picture of the liver and small bowel allograft. The liver is to the left of the picture, and the spleen can be seen lying within the loops of the small bowel (spleen is removed later). Removal of the native liver. Left behind is the cavity into which the liver and small bowel allograft will be placed. Postrevascularization image of the liver and small bowel allograft. The allograft, prior to closure, positioned within the recipient's abdomen. The wedge-shaped excision (biopsy site) seen on the donor organ was performed at organ procurement. These biopsies are selectively performed to review the suitability of organs in instances where issues of suitability are raised. Survival figures 2007. Image courtesy of the Intestinal Transplantation Registry (ITR). Intestinal transplants by year. Image courtesy of the Intestinal Transplantation Registry (ITR). Table 1. Intestinal Transplant Programs - 2011. The authors wish to thank Dr. Wendy Grant, Assistant Professor of Surgery, Section of Transplantation, University of Nebraska Medical Center, for providing the multimedia images in this article and the Intestinal Transplantation Registry (ITR) for providing the charts in this article.